The chart walls are one of the important chart components, which contribute for the realistic 3D look of the scene and improve the readability of the presented data. 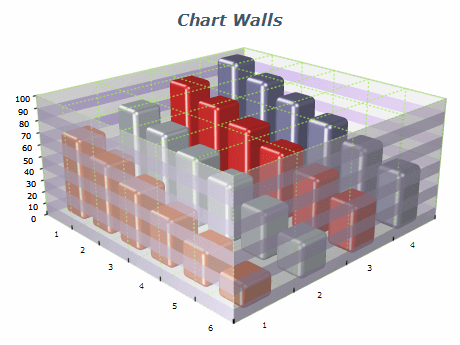 In 3D mode Cartesian charts have six walls (one wall for each side of the chart box). In 2D mode Cartesian charts can display only the back wall (ChartWallType.Back). Polar and Radar charts have only one chart wall, while Pie, Funnel and Venn don't have walls at all. User can control various aspects of the chart walls including their visibility, width, fill style, border style and interactivity features. In addition an automatic visibility mode of the chart walls can be enabled for 3D charts that are frequently rotated in which chart walls will be dynamically shown and hidden so that the data is never overlapped by a wall.